1 of 2 Peel oranges and cut into 1/4-inch-thick slices. Fan onto a serving platter. 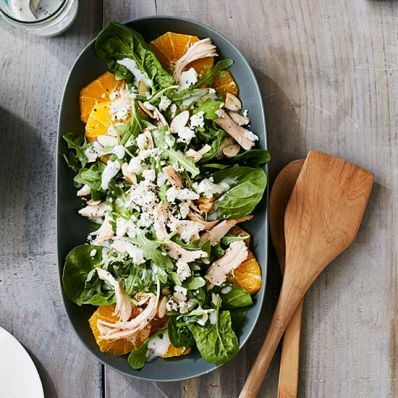 2 of 2 In a very large bowl, combine arugula, chicken, goat cheese and almonds. In a small bowl, whisk dressing and vinegar. Pour over arugula mixture and gently toss to combine. Pile over orange slices and serve. Per Serving: 345 kcal cal., 20 g Fat, total, 23 g pro., 572 mg sodium, 3 g fiber, 15 g sugar, 6 g sat. fat, 22 g carb.